Make your own homemade yogurt from scratch with the super-simple crock pot method! 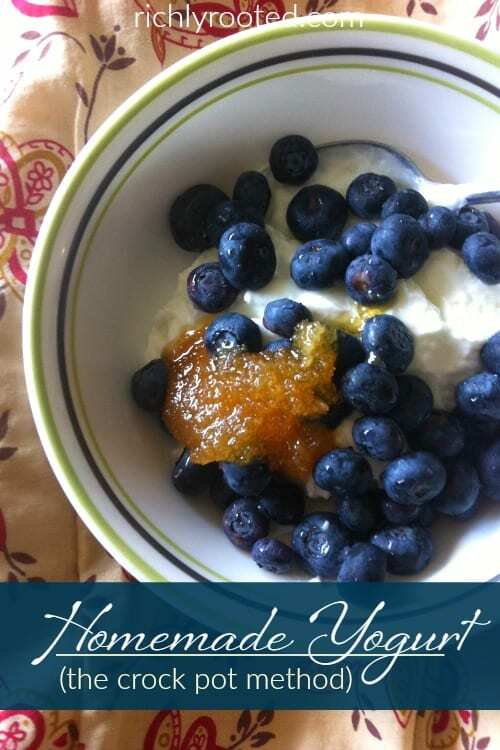 DIY yogurt is so easy and frugal, you’ll never want to go back to store bought! Essentially just milk, cultures, and sweeteners. If you make your own yogurt, you get control of which sweeteners go in, while also saving money. And since yogurt is a nutritional powerhouse, it’s a great recipe to incorporate into your regular cooking routine. 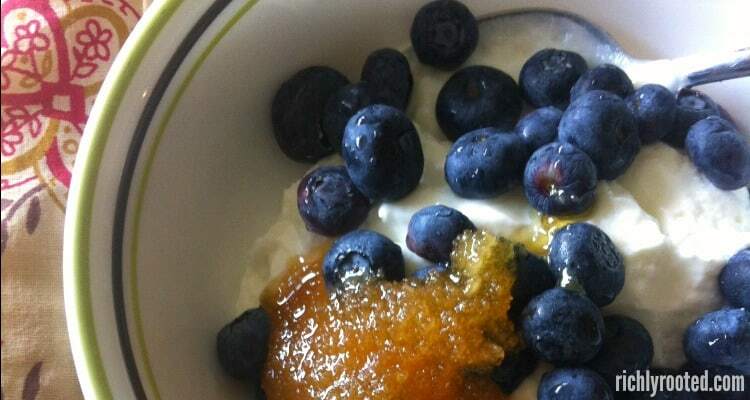 I eat yogurt almost every day, so that I have good bacteria living in my gut to help my digestion. In fact, yogurt is so good for you that I believe it’s one of the foundational first steps to eating a real food diet. It’s also super frugal. My husband and I figured out that we can make nearly twice as much yogurt for half the price of a store-bought tub of plain yogurt! And if you’re accustomed to buying flavoured yogurt or the individual yogurt cups, you’ll save even more money by making it from scratch. Yogurt gets its thick consistency from the living bacteria which ferment the milk and change its chemical makeup. Yogurt bacteria need a warm environment to thrive, and they need time to do their job of fermenting. We always use whole milk to make our yogurt. The finished product is rich and creamy and retains all those good fats. If you have access to it, you can make homemade yogurt with raw milk, although the process will lightly pasteurize the milk. The “skin” that forms over the milk during the heating process is called nata. You can skim it off and eat it–it’s tasty! I’ve been making yogurt in my slow cooker for six years and counting. I’ve tried various real food practices over the years, and this is one that has stuck! Put the 1/3 cup of yogurt on the counter so it will begin to come to room temperature. Pour 1/2 gallon of milk into cooking pot and warm over medium heat on the stove top. Stir occasionally. When the milk becomes bubbly and frothy, let it froth for another 5-10 minutes. Take milk off heat and let cool until it is hot--but not burning--to the touch. Feel the inside of the crock pot; it should be warm but not burning to the touch. If it is too hot, turn heat setting down to "Keep Warm," or turn off crock pot completely to let it cool slightly. When the milk is no longer burning to the touch, mix about 1 cup of milk with the 1/3 cup of yogurt, stirring gently. Pour the remaining milk into the crock pot, then gently stir in the yogurt mixture. Turn off and unplug crock pot, cover with lid, and wrap in one or two heavy towels. Let crock pot sit for at least 8 hours, or overnight. After 8+ hours, place crock pot in fridge and chill completely. After yogurt is thoroughly chilled, dip out 1/3 cup of yogurt and set aside to be the starter culture for your next batch. For a thicker yogurt, you can drain off the whey liquid that forms over the yogurt. You can add this mineral-rich whey to soups or smoothies! To flavour yogurt, try stirring in maple syrup, raw honey, vanilla or almond extracts, fruit, shredded coconut...the possibilities are fun and limitless! From beginning to end, how long did this take you? Longer than you expected? Or less time? The difference in regular yogurt and Geeek yogurt is the whey. Greek yogurt has all of the whey strained out, which gives it the thicker consistency and tangy flavor. It took about 10 minutes (max) of prep, and then I let it culture overnight and cool in the fridge, so about 12 hours altogether. I only make it when I’m already doing something else in the kitchen too, so I hardly notice the extra work. I’m ecstatic about how easy it is! I don’t know what the difference between regular and Greek yogurt is, other than the thickness. Maybe it uses special Greek cultures?? Although it’s probably just about the process. Thanks for following! Good to hear from you again. Elsie, I think you can get a thicker consistency (more like Greek yogurt) simply by straining it in cheesecloth, a tea towel, or coffee filters set in a strainer. Yummy! We do this with regular yogurt from the store. What type of consistency do you usually get from your yogurt? I make mine from goats milk and it seems to be too runny. It sets, but not well. I’m about to strain mine to get the consistency better. I calculated how much making my own yogurt saves every year and it was over $200! I’m so happy that more and more people are learning how really quick and easy it is to make your own yogurt. So glad you shared this! I used to make mine in the crock pot, but I’ve switched over to just using the stove instead. For some reason in my head, a pot seems easier to clean than the heavy crockpot. Ha! I have a dairy sensitivity. Have you tried or do you know if you can make almond or coconut yogurt using this method? Or even goats milk? I have read the difference between Greek yogurt and regular yogurt is the protein/ calcium levels. Greek yogurt has a higher protein level but regular yogurt has a higher calcium level. That’s interesting! I didn’t know that. I think I like regular better, personally, but Greek is good for certain recipes. What yogurt do you recommend to start this recipe? I like the regular Dannon plain, full-fat yogurt. However, I’ve tried a couple of other brands, too, and not had problems. I made this chicken last week and it was amazing! It loved that it was simple and didn’t have a lot of ingredients but there was such a great depth of flavor. I will be making this time and time again! Thanks! Thank you so much for the feedback! I’m so glad you enjoyed it! Can you make Plain Yogurt and then add flavorings to part of it after it is made? Yes, you can. Just divide it up after the finished batch is completely chilled. One of my favourite flavorings recently is to stir in brown sugar and almond extract. Welcome to my blog! I’m so glad you’ve been enjoying it, and I hope everyone likes the yogurt! I’m still making the same recipe 8 years later. 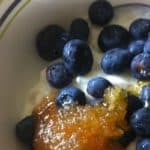 To get everyone on board, I’m sure it could help to keep some yogurt topper options on hand…almond slivers, berries, maple syrup, jam, vanilla extract…hopefully they’ll end up liking the homemade much better and not want to go back to storebought!